Home / Resources / Highway History / General Highway History / Back in Time / Sideling Hill Mountain, I-68-Are We Going Over It or Around It? Sideling Hill Mountain, I-68-Are We Going Over It or Around It? As you travel toward the historic city of Cumberland, Maryland on I-68 from either direction, you will see a mountain ahead in the distance that makes you question if the highway will go over it or around it. As you travel, you strain to see the roadway for your answer. Upon approach you will see that there is a cut in the mountain and you will have the scenic pleasure of not driving over it or around it, but driving through it. My husband and I recently had this pleasure on yet another of our motor home adventures; and as I have ancestral history in the Cumberland area, I found it especially interesting. Opened in 1991, Interstate 68, known as the National Freeway, follows the Old National Road of the 1800's. 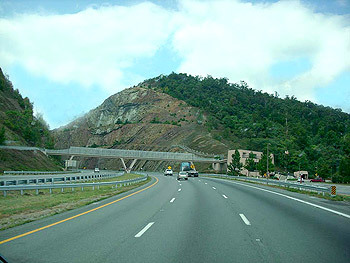 It is the east-west tunnel and toll-free roadway linking western Maryland to northeast West Virginia and it just happens to go through Sideling Hill. Looking west on Sideling Hill, Maryland. Photo by Rickie Longfellow. For centuries the mountain had blocked the way for travelers who had to decide if they wanted to go over it or around it. Most chose to go around it, but the road was treacherous resulting in many mishaps. In the 1920s and 1930s, many travelers had been afraid of the drive down the mountain; whereas the drive up the mountain was not quite as frightening. Instructions were posted on how to descend Sideling Hill by coasting and lightly applying the brakes and further stating that the curved roadway ". . . presents no danger to the experienced driver who knows about it in advance." When Maryland officials decided to build an Interstate highway to connect I-79 in West Virginia with I-70 and I-81 in Maryland, they decided a safe and straightforward crossing of the mountain was in order. How would this be accomplished? Studies found that a tunnel would cost nearly double the amount of actually cutting through the mountain, and the maintenance for a tunnel would be more costly than the upkeep of the roadway. So it was decided to slice through this rugged mountain. 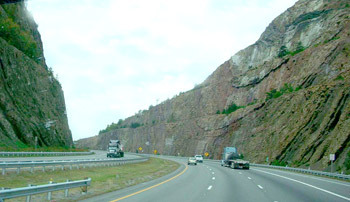 Sideling Hill, Maryland, is a Paleozoic Era (570-230 million years ago) geologic treasure for not only the professional, but the roadside geologist. Photo by Rickie Longfellow. We've seen mountains like this on our journeys-cut out so the road can pass through. In fact, over the years I have gotten excellent photographs in a variety of terrains, and some unusual shots-growth, such as Prickly Pear cactus emerging sideways from the rocky sides of sliced mountains and shiny galena that looks like it is wet on a hot sunny day. Sideling Hill is a Paleozoic Era (570-230 million years ago) geologic treasure for not only the professional, but the roadside geologist. The 340-foot cut is considered one of the best rock exposures in the United States, its man-made 10-20 foot side ledges of sandstone, shale, and siltstone in various colors serves to accent the alternating bands of coal. Marine and plant fossils were discovered encased in the mountain while moving nearly 3.5 million cubic meters of sedimentary material, further proof that this part of Maryland was once under the ocean. First noted by early explorers and surveyors on a 1755 map as Side Long Hill, the 350 million-year-old mountain had served the settlers well. During the 1700s to 1800s, forts stood along the eastern side to guard the early pioneers as they settled into the area. My ancestors settled near Cumberland in the early 1800s. As we approached Sideling Hill, my husband at the wheel and me snapping digital photographs, I went back in time to visions of my ancestors. There they were-my great-great grandparents in their covered wagon, probably traveling the new National Road, with a wagon train from the east. As they looked forward to reaching Cumberland, Maryland where they would settle down, and where my great grandfather would be born, there it was before them-Side Long Hill. I will just bet they had the same question for the wagon master that I had-are we going over it or around it? Little did they know that one day, thanks to modern engineering, their great-great granddaughter would go through it.